Fourstones welcomed local MSP Jenny Gilruth who represents the mid Fife and Glenrothes constituency to our Sapphire Paper Mill. 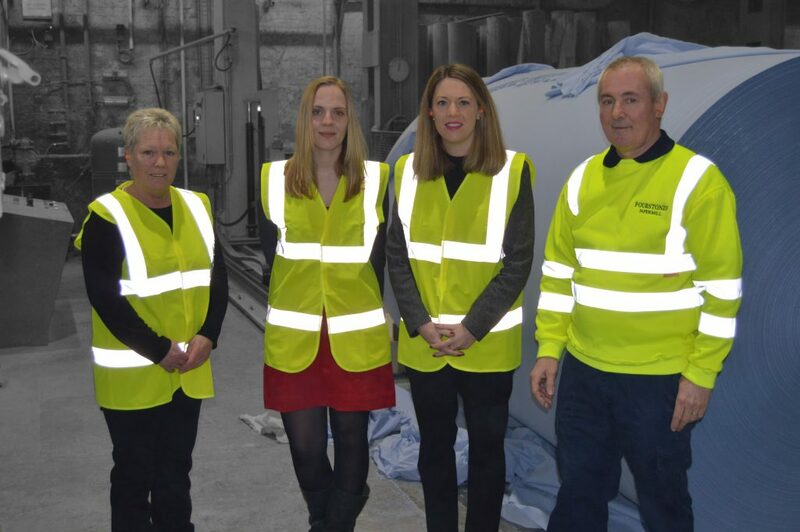 Fourstones recently invited Local MSP Jenny Gilruth to our Sapphire Paper Mill site in Leslie, Fife. Owners Peter Duxbury, winner of the 2015 Gold Medal Award for the paper industry and Pauline Duxbury were happy to host Jenny at our site. During the visit both Peter and Pauline were able to talk to Jenny about our company and market. Our discussion included how our company feels very optimistic about the future as well as highlighting topics such as the increasing energy prices that affect heavy industry such as paper making. The visit ended with a site tour to show how the end product is formed on both our paper machines and converting department. Owner Peter explained the processes used in production as well as mentioning the importance that external local companies have had in the construction of our machines. The tour concluded with a brief overview of the mills history and how the site has changed over the last 100 years. Jenny’s visit to Sapphire Paper Mill highlights how our company is keen to work closer with our local communities. Sapphire Paper Mill was previously owned by the Smith Anderson Group under the name of Fettykill Mill. The site manufactured heavy duty papers and bag products. In 2006 the site shut with many assets being sold including one paper machine. After multiple bids to buy the closed site, Fourstones Paper Mill succeeded in 2009 in the wake of the economic downturn. Owners Peter and Pauline Duxbury along with their dedicated and knowledgeable team worked tirelessly to bring the site back to life. By 2010 Fourstones had successfully converted one paper machine to manufacture tissue parent reels. In 2013 Fourstones installed a continuous production converting line to manufacture away from home paper disposables. Due to strong demand for tissue parent reels, Fourstones began to recommission the second paper machine at our Sapphire Paper Mill site in 2014. This paper machine included a crescent former manufactured in China, the first of its kind within the UK. The project was overseen by many of the same management that were involved in recommissioning the sites first machine. In 2015 the machine was complete shortly before the devastating closure of Tullis Russel, another local paper mill less than 10 miles from our Sapphire Site. Fourstones was able to employ staff from the closed mill, increasing our knowledge and skill base from within the paper industry. Currently Sapphire Paper Mill is in a very strong position with scope to both extend our converting operation and install a third paper machine. Fourstones is very proud of its hard working staff who have helped achieve this level of success. Simply put, this is a very exciting time for Fourstones Paper Mill Co Ltd.